Cowley College’s Robert Brown Theatre played host to the sixth annual Miss Walnut Valley/Miss Cowley County Scholarship Pageant on Sunday, August 23. The scholarship pageant, which is a preliminary pageant for Miss Kansas and Miss America, was won by Allison VanNahmen, an 18 year old from Spearville, Kansas. VanNahmen is the daughter of LaWana and Lyle VanNahmen. Her platform is “Understanding Mental Illness.” For her talent, she played the piano with a vocal solo to “Stay” by Rihanna. VanNahmen received a $1,000 scholarship and has the opportunity to attend Cowley College tuition free. Also appearing at the pageant were 2015 titleholders, Miss Walnut Valley, Kristen Boxman of Arkansas City and Miss Cowley County, Calley Watters of Arkansas City. Cowley College president Dr. Dennis Rittle and Wellness Center manager Gage Musson served as judges for the event, while part-time Wellness Center concierge LaDona Anstine and Sarah Bryant, Cowley College director of marketing, are members of the Miss Walnut Valley Board. Milan Anich, Cowley College technical director of theatre, handled the lighting and sound, and custodian Gary Hale helped prepare the facility for the event. Several Cowley College students also served as stage crew. By being crowned Miss Walnut Valley, VanNahmen earns a spot in the Miss Kansas pageant held in June 2016 in Pratt, KS. 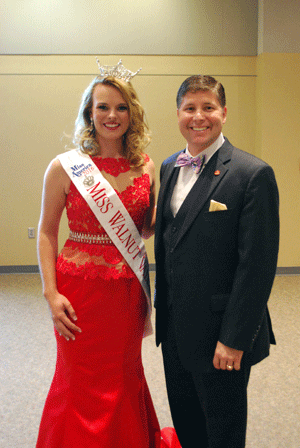 Pictured is Allison VanNahmen, Miss Walnut Valley, and Cowley College president Dr. Dennis Rittle.